Over the past years, online rummy has attained tremendous success. Once it was mistaken to be a game of luck, but finally, Indian rummy game has been legally identified as a game of skill. Yes, this is a game of skill that requires good analytics and math. If you win a game of rummy online, you can win real cash prizes. However, rummy has more lasting and fruitful benefits to offer than just the winning prize. It enriches the player with certain set of cool skills that can help him/her in personal and professional life. 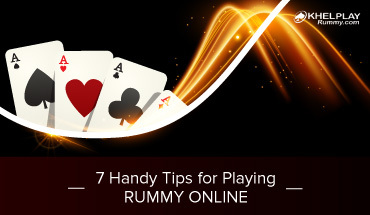 Let’s look into the skills that can be developed by simply playing online rummy. Online rummy players have sharp decision-making skills, precisely because they have to make the trickiest decisions while playing the game. They cannot see their opponents to read their gestures and predict their gameplay. Online players depend strictly on analyzing the cards and making the right move. Decisions taken by professional rummy players seldom go wrong. This ability to analyze helps them in real life while taking quick, tough decisions as well. Multitasking is a part of everyday life – we do it at work, home, while travelling, etc. While it is an important skill to own, if not executed correctly, can lead to disastrous consequences. This skill of multitasking gets nurtured and enhanced while playing online rummy cards. When playing online rummy, players have to watch the cards in the open deck, keep a constant watch on your cards, remember the cards picked up by your opponents and random Jokers, etc. So, they are more alert and good multi-taskers than those who do not play online rummy. When too many tasks are handed, many end up messing with all of them because they fail to identify which task takes priority over the others. However, this is where online rummy players perform better than the rest. This extremely crucial skill is inculcated among rummy players because while playing the game, they tend to focus on creating a pure sequence or set. Once that is achieved, they go for other formations like impure sequences and sets. Hence, it can be concluded that online rummy helps sharpen your skill to prioritize tasks. Once you start playing online rummy, your negotiating skills are improved because this game involves you doing that precisely. The rummy player has to choose the right cards to pick and discard. Plus, the player’s success depends on making the opponents discard a card needed for his/her victory. In real life, this technique comes in handy. An efficient person is the one who is able to achieve his target with whatever resources are available. So, he/she must plan in such a way that the limited resources available are put to utmost use. While playing a rummy game, cards are of very little help, and the player has to form sequences and sets as per the objectives of the game. For this, all sorts of permutations and combinations are put to use. This, in turn, hones your ability to automatically make maximum use of the limited resources available at hand to complete a particular task. I have been playing online rummy with my friends since college days. I came across your blog a few days ago and I am shocked to see so many benefits of playing the card game. Never had I thought that my hobby was actually helping me develop so many skills like decision-making and efficiency. No doubt I am doing fairly well in a start-up that I am working for. My dad has ace level multi-tasking skills and I always wondered how he that developed it. Well, this post is certainly the answer to my query. My father is an ace level rummy player and love to play rummy all the time. This game has helped him in more ways than I could have ascertained. As a kid, I was under the false impression that card games, including rummy are all about gambling and bad for one’s mental health. However, in my twenties, I learned about rummy game and understood that it’s not a luck but rather a skill based game. Even legal rummy I confirmed to be a skill based game. And now when I read articles such as this one, I realize that this card game is extremely beneficial and should be played by all.